Good health, intelligence, amazing willpower and eagerness to succeed, as well as a happy family life, have made Yang Liwei China's first astronaut. The 38-year-old, who returned safely to earth early on Thursday after orbiting the planet 14 rounds on a 21-hour mission, was an intelligent student, air force pilot and astronaut. On Thursday, he was flown to the Beijing-based Space City, where he works and lives as an astronaut, soon after he landed in Inner Mongolia Autonomous Region, north China. A medical check passed him as perfectly fit. Born to a family of teachers in 1965 Suizhong County, north China's Liaoning Province, then the country's leading industrial center, Yang had a happy and tranquil childhood. Unlike that of Soviet cosmonaut Yuri Gagarin, the first man in space, and Alan Shepard, the first American astronaut, Yang's family background was by no means humble or poor by Chinese standards. Gagarin was a carpenter's son and Shepard grew up on the family farm. At that time, hundreds of millions of his compatriots had little education, and the number of people under the poverty line totaled 250 million by the late 1970s, mostly farmers. The profession of teaching also meant a stable income and life-long employment in China in the 1960s. He was intelligent as a child and a good team leader of his playmates, his parents recalled. With good scores in middle school entrance exams, Yang was selected by the best middle school in the county. Yang won many prizes in maths competitions. In 1983, Yang was recruited by the No. 8 Aviation College of the Air Force of the People's Liberation Army (PLA) and became a fighter pilot after graduating with a bachelor's degree. He was a straight A student in every subject during his four year training. He became an attack aircraft pilot in the air force, and he was rated the elite of his air force division. Yang demonstrated his crisis management capability during a low flying exercise in the summer of 1992 in north China's Xinjiang Uygyur Autonomous Region. One of the two engines of the fighter jet suddenly stopped working in mid-air following a loud noise. With great calmness, he reported what had happened to the ground command center while operating the aircraft carefully in a bid to fly home. His aircraft climbed to 500 meters and then 1,500 meters, and eventually over Mount Tianshan. But the other engine stopped working when he was close to the runway. Without hesitation, Yang moved to put down the undercarriage, and the plane managed to land without power. Yang was all wet by sweat when he climbed out of his cockpit amid cheers from his colleagues. The division commander greeted him with the decision to record a third-class merit for Yang. As a fighter pilot, Yang had 1,350 hours of flight experience. He was chosen, with 13 others, from among 1,500 pilots for space flight training. Yang passed China's stringent astronaut selection tests in 1996 and 1997 with excellent physical condition, including low oxygen resistance capability in aircraft 10,000 meters above the ground. He began to receive theoretical training on manned space flight in Beijing after he was selected for the first group of Chinese astronauts. The 30-strong course included an "ABC of Manned Spaceflight" and "Identification of Stars", aviation dynamics, air dynamics, geophysics, meteorology, astronomy, space navigation, design principles and the structure of rockets and spacecraft, as well as equipment examination. Moreover, they received systematic training in space flight simulators. "To establish myself as a qualified astronaut, I have studied harder than in my college years and have received training much tougher than for a fighter pilot," said Yang. During the first two years of training, Yang, 168 cm tall and a lieutenant colonel, said he never went to bed before midnight in order to be the best. In a bid to improve his English, he often called his wife from his apartment in Space City, asking her to help him practice English. Yang, who used to be poor in English, passed English-language tests with full scores. He performed well in exercises designed to improve weight resistance capability in simulators moving at speed. But for Yang, training was not confined to training sites. He was once found by his wife Zhang Yumei moving in circles at home. He explained that he was practicing for upcoming tests on a special swivel chair. A senior expert in charge of the training said Yang was the best of his students, his favorite. Yang chose not use pillow on his bed for several days before a training session in which the head of a trainee was in a position lower than the rest of the body. 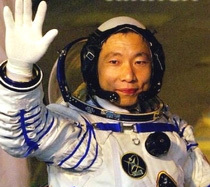 Su Shuangning, director-general and chief designer of the astronaut system under China's manned space program, described Yang as a sober-minded person with a "superb capability for self-control". To his wife, Zhang, a middle school teacher, Yang is a caring husband, and to his eight-year-old son, Yang is a hero. Zhang said she could not forget the expression in his eyes when she was about to be carried into an operating room for a kidney biopsy operation in July 2001. She suffered nephritis. "Just at the moment when I was to enter the operating theater, I saw the expressions of extreme care, love and regret like I've never seen. I felt as if a knife had pierced my heart," recalled Zhang. She was very weak after the operation, but Yang had to leave Beijing three days after the operation for upper air training in Jilin Province, northeast China. Yang sat at on a chair beside her sickbed throughout the whole evening before his departure apparently to express his love and care for his wife. He asked his mother to come to Beijing to look after his wife for him during his absence, and declined an offer from his commander to postpone the training, in which he did quite well. As China's first manned space launch drew closer, Yang was among the three finalists chosen for the maiden voyage. In order to familiarize himself with sophisticated operations, Yang put all the charts on facilities inside the capsule on the wall in his dormitory. He also video-taped the equipment and structure of the capsule, and recorded the footage on a video compact disk on its own so that he could watch it in his spare time. During the last professional technical tests, Yang did identified and remedied all the "faults" his instructors had set up. His instructor would ask him after each test whether he had made any operational errors, and he always answered confidently, "No errors at all". During five tests of normal flight procedures, he got 99 scores out of 100 in two and full scores in three tests. In an interview before the manned mission, Yang told Xinhua he could recite all the flight and operation procedures. "I can still remember the positions of all meters and switches inside the capsule even when I close my eyes. I can describe the color, position and role of any part of the capsule you name. "I'm capable of coping with an emergency situation without the flight manual." His psychological instructor once asked him what he would feel if he were to fly a real spacecraft. "I think I would be more relaxed than in training. So let me go for the flight," Yang answered with a smile. Yang Liwei to Kick Off TV Series "Shenzhou"